Chess is cool too. Who knew! 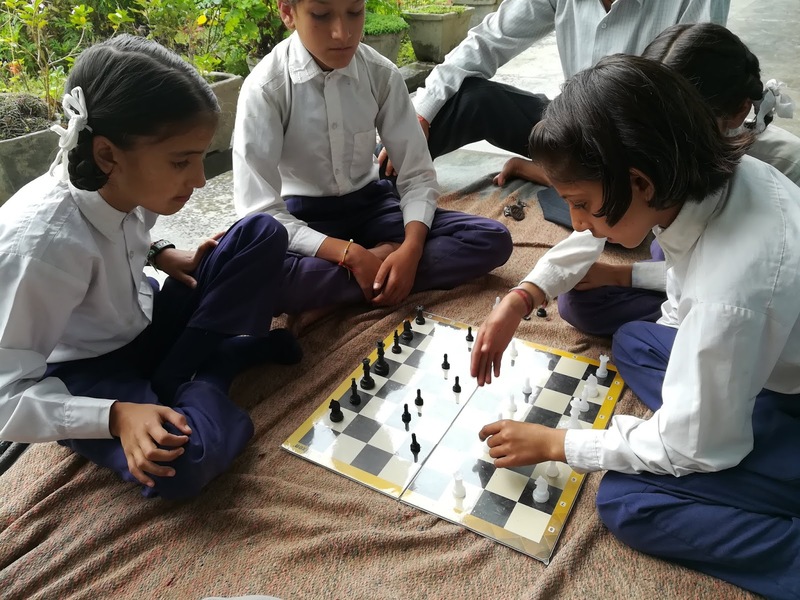 It has been only about 3 weeks since the children at SMTA school were introduced to a 'thing' called chess. Many of them seem to have taken up the game quite assiduously. 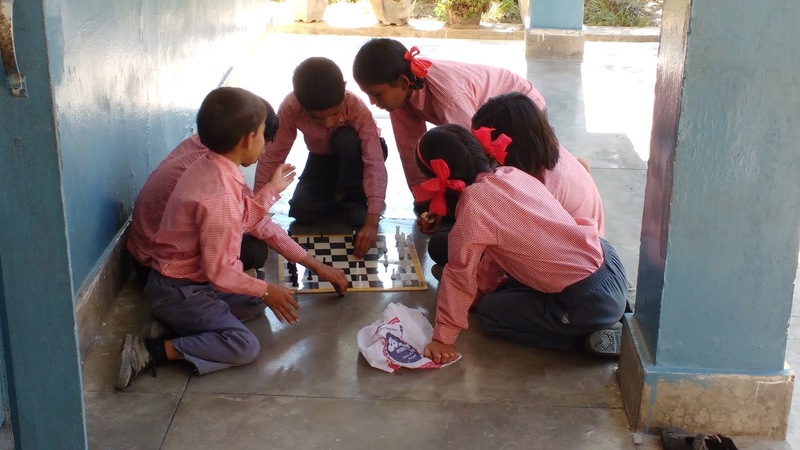 Both the chessboards are always occupied during lunch breaks. Sachin is participating in a five day workshop organised by Smile foundation. Facilitators are Mukesh and Nav kislay. Many participants are from Tibetan children village and schools. Time to look for funds closer to home, and why not? There are about 25+ participants. It is participatory and fun. 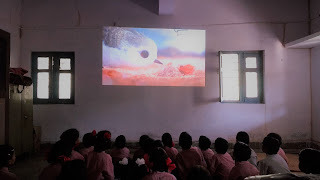 One fine morning, right after the daily assembly rituals, the children and the staff at the SMTA school watched ‘Piper’, a 2016 short animated movie (IMDB, YouTube Teaser). This six-minute movie, with its highly realistic, vivid animation and without any spoken dialogue, showed the story of a little sandpiper bird. The baby bird is part of a flock of sandpipers who live by the sea shore. They are shown as running forth and hunting for food among the receding waves, and rushing backwards when the waves come in, this back and forth movement being the fulcrum of their existence. The protagonist- our little birdie, is initially reluctant to leave its nest and pleads its mother to continue feeding her. The wise mother gently encourages, pushes and prods her little one to leave the nest and face the waves. The baby yields but soon finds itself drenched by a huge wave. This terrifying and traumatizing experience appears to have scarred it forever, as it heads back to camp itself in the nest. But a providential turn of events that involve the unlikely help of a family of hermit crabs, sees the baby bird once again at shore and drenched by a huge wave. But this time, in that brief moment of being drenched, a moment that contained the magic of all existence, the birdie opens its eyes and discovers a new submarine world, a new way of being, of exhaling under water. Lo and behold, the fear turned into joy, the little piper is no longer afraid of the waves. While the rest of the flock continue with their usual behaviour of retreating from the approaching waves, the little piper seemed to have gone beyond the collective behaviour of the rest of the group. Jumping, hopping, chirruping, it no longer retreats but meets gleefully the waves that had earlier seemed to be its nemesis and is soon able to gather food not just for itself but for the entire flock! Afterwards, we had a small discussion on topic of fear. The children seemed to be able to broadly make out and understand the theme of the movie. One class 5 student summed it up saying, “If I always run away from fear, I will never be able to drive it away.” The children seem to understand quickly, but do we adults do? We, the educators, parents, guardians, must examine the kind of environment we are providing our young ones with. Are our class rooms and homes free of all external fear? Are we able to encourage the little ones, like the wise sandpiper mother does, to venture forth through all their inner fears, in whatever they do and in the process have their own little ‘aha’ moments of magic? If not, then we still have work to do. 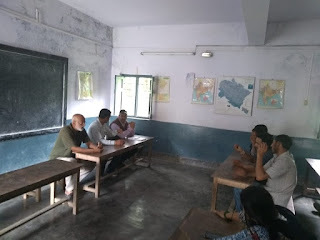 Sachin did a focus group discussion with some students of BBA at Dakpatthar PG college, to understand the kind of services they may appreciate our require, while transiting from college to job. It was 20 Sept. Fingers crossed and still paying. This was the scene in one of our classrooms a couple of days ago. The experience of being wonder-struck at being told or shown something truly ‘new’, is a pretty common phenomenon in childhood, and perhaps a rare occurrence in an average adult’s life. It had been noticed that many children are in a habit of tearing off pages from their notebooks. Waste bins overflowing with paper is a pretty common sight here. So, this morning, during assembly we all watched the following video showing how paper is made. And then a couple of videos more talking about the history of paper and the importance of trees for all life. 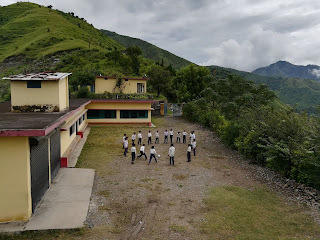 At the end of the videos, followed by a small discussion, the children seemed to have understood, at least verbally and hopefully in a deeper sense too, the importance of not wasting paper and of saving trees. P.T.A.Meeting Apna School Smta Nikean Jakhadhar (Chakrata)On- 5/09/2018. Sultan and Sachin had a brief visit with the children on 4th and 5th Sept. 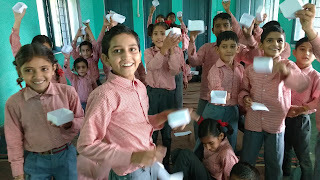 They were ably assisted by the teachers - Chain Singh, Ankush and Radha. The children were taught how to play chess. Great fun! Children discovered soon that there was a strategy and some thinking involved behind "slashing" right and left..
Children were also led into a moderate play of volleyball. Those children, who were a little awkward with throw and catch, were given more chances.. 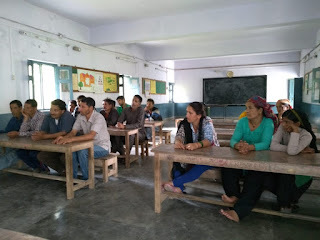 The PTA meeting, beginning at 1.30 pm on 5th September and was an equally fun and chaotic experience: at times four people were putting their points across, with equal vigor! This is how this rural community often communicates- and with great success too! Finally everyone agreed that coming 14th November, we must put up a big show for our children: Sports day! 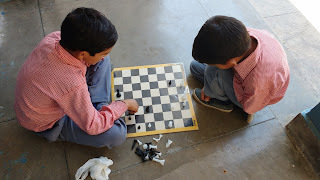 We are exploring some new ideas in the school: alternate day, morning assembly will have a slightly different format- to incorporate some creative / parallel ideas, exploring, crafts, creativity, innovative thinking- a step beyond the curriculum.